Abstract. 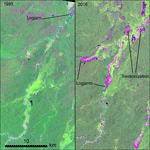 This paper investigates the dynamics of logjam-induced floods and alluvial deposition in the Bolivian Amazon and the effects these have on forest disturbance and recovery cycles. It expands on previous work by Gullison et al. (1996) who reported a case of catastrophic floods triggered by logjams in the Chimane Forest in the Bolivian Amazon. No further studies have followed up on this observation and no research has been published on the effects of large wood in tropical lowland rivers. The study is based on the analysis of a time series of Landsat imagery (1984–2016) and field evidence. 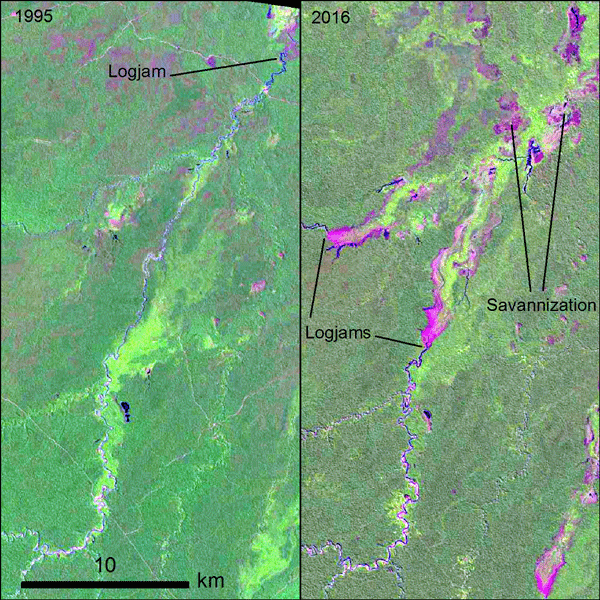 Results show that logjam-induced floods are a major driver of forest disturbance along the Andean piedmont in the Bolivian Amazon. New logjams form on an almost yearly basis, always further upriver, until an avulsion takes place. Logjam-induced floods are characterized here by the sudden deposition of a thick sand layer and the death of forest in a V-shaped area. The Bolivian Amazon offers a unique opportunity for further research on how large wood affects river behavior in lowland tropical settings and how large and frequent forest disturbance events resulting from river logjams affect forest biodiversity and community successions. How to cite: Lombardo, U.: River logjams cause frequent large-scale forest die-off events in southwestern Amazonia, Earth Syst. Dynam., 8, 565-575, https://doi.org/10.5194/esd-8-565-2017, 2017. In lowland Bolivia, satellite images show rivers collapsing and the replacement of forest with savannah. This was first described in 1996 as the result of logjams (river dams created by fallen trees). I have investigated how the logjams form and affect the forest through remote sensing and fieldwork. Logjams occur nearly every year and propagate upriver until the river changes course. This region offers a unique opportunity to study how frequent forest die-off events affect biodiversity.